Did you know that your BOMA/Chicago membership dues accrue a direct dollar for dollar benefit to your property, staff and building owners? 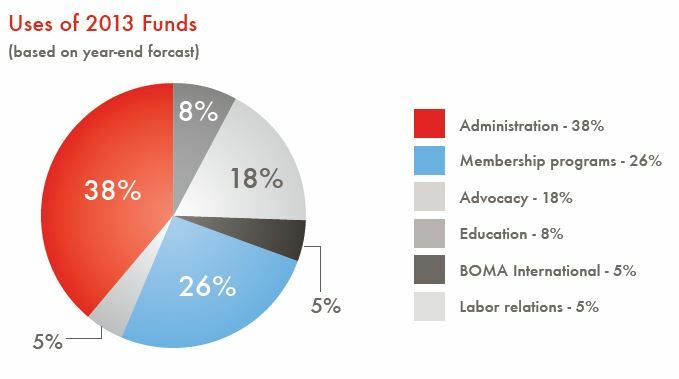 As all of you are preparing to pay your 2014 BOMA/Chicago invoices by January 30, we wanted to take time to reflect upon the membership benefits you received in 2013 – and how each dollar of your dues translated into advocacy efforts, membership programs, educational seminars and labor relations. One year ago, the BOMA Chicago Energy Center, LLC was created to manage the BOMA/Chicago Smart Grid Initiative. By October 2013, the central servers were successfully installed and two member buildings began piloting the network. Throughout 2014 and beyond, this ground-breaking program will provide participating member buildings with real-time energy usage data which will greatly reduce energy costs through more effective energy management. In March 2013, BOMA/Chicago released its second Economic Impact Study which was developed to glean critical information on the state of Chicago’s commercial real estate industry and to better understand our members’ economic value to the City of Chicago. A panel of seasoned industry leaders delivered a Mid-Year Market Review in June 2013 highlighting the climate of Chicago’s commercial real estate market. This panel was very well-received by both our membership and the Chicago media, positioning BOMA/Chicago as an industry leader and valuable resource. The following articles summarize the panel’s message as captured by GlobeSt.com, BisNow Chicago and the Illinois Real Estate Journal. In July 2013, BOMA/Chicago launched a new website and member database system that provides a resource driven, easy-to-use tool that you can access 24/7 to manage all membership activity including online billing, registering for an event or finding member contact information. Still need to pay your dues? Simply log onto the website and click “Pay 2014 Membership Dues” in the “My Profile” box on the right side of the homepage to both view and pay your invoice. After Illinois became the last state to pass the Firearm Concealed Carry Act, BOMA/Chicago held an open security meeting to answer questions about the law and how it will impact commercial office buildings. Former State’s Attorney, Richard Devine, of Meckler Bulger Tilson Marick & Pearson, LLP, and current Assistant State’s Attorney of Cook County, Brandon Nemec, gave a thorough presentation to help members decide upon and implement concealed carry processes. Tracked 172 pieces of state legislation in the last session of the General Assembly. Houses TWO lobbyists in Springfield who work to promote the best interests of our members in FOUR major areas: Codes and Standards, Energy and Sustainability, Emergency Preparedness and Life Safety and Taxation. Secured 400 smart meters for the Smart Grid Initiative through negotiation with ComEd. Held dozens of events and educational programs that over 2500 members attended. Awarded FOUR RPA designation scholarships to develop the next generation of industry leaders. As valuable members of this organization, it is important for you to know how your membership dues are used to create a favorable return on investment. Just like last year, we will dedicate 2014 resources to advocate on your behalf, offer industry-specific education and career development opportunities and host networking events to strengthen your relationships with other CRE professionals. What has brought you the most value as a BOMA/Chicago member? How can we improve in 2014? Leave us a comment or suggestion – we value your feedback. What’s the Buzz at Beacon Capital Partners?